Greetings from my world of gingerbread and travel arrangements. Thanks for stopping by the blog in the midst of all the holiday hubbub. My house was full of kids yesterday, ranging in age from 2 to 10. Friends came by to decorate baked goods, and after a good spell of dressing the cookies in colored icing (picture a table laden with 8-inch ginger people, there’s Santa lounging alongside a bikini-clad ginger lady, my three-year-old’s green abstraction, the nine-year-old’s bloody vampire with the toothpick stake through the heart, and diverse others) the kids ran out to the back yard to shout and jump. The parents sat around talking for the rest of the afternoon–about birth timing and blogging, among other things. The three women in the group each had two kids: one started at 39 and is now 50 (that’s me), another began at 33 (she’s now 44) and the third had her first at 19 (she’s now nearly 25). So our experience and our viewpoints varied — but we’re all happy and hardworking moms. Another 50-year old friend who’d planned to come by couldn’t make it because she and her husband had to go downtown to get the police clearance required for their second adoption (she was 47 at their first). And yes, every adoption requires a clearance. 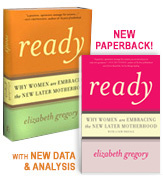 Birth timing and some of its effects (particularly for women who start their families at or after 35, by birth or adoption) are the topic of my book Ready, which debuts in the bookstores on December 24th. Fascinating topic, of course! and a subtext of just about every other story in the news it seems. There are the obvious connections to issues like the politicization of birth control (both contraceptives and abortion), and to the dynamics of women’s work (what’s the effect of the general lack of family friendly workplace policy on the ages at which women have kids? and what connections are there between the current push toward family friendliness, the work status of the women making the case and their ages at first birth?). And then there’s the supermarket news. These days, birth timing is the big story in the ladies’ magazines. Not that they say so outright, but that subtext pushes one pregnancy story after another onto cover after cover–Salma Hayek gives birth at last at 41! Jamie Lynn Spears pregnant at 16! Christina Aguilera pregnant (and baring her belly on the cover of Marie Claire) at 27! Julia Roberts delivers again at 40! Joan Lunden mom to new twins at 55! Quite a range. What do their situations tell us about our own? In some part these headlines seem to purvey a rather conservative message: every woman yearns for a baby and that’s where the truest fulfillment lies (never mind that it’s the fact that they were career girls first that makes these women celebrities). But at the same time, the covers address a confusion that many young and no-longer-so-young women (those who do think they want kids) are feeling about when’s the best time for them to start their families. What is the relationship between the work I want to do and family timing? How late is too late fertility-wise? What if the right guy (or gal) isn’t ready yet but I am? What if he or she wants kids, but I need more time without them? What if there’s no good partner in sight? Women’s options today are different than ever before, and they’re dynamic — changing as we move along. We all participate in figuring out what makes most sense for each of us now, by observing and talking with one another, pretty much incessantly–through the checkout tabloids, around the dining room table, in the news, via the bookstores, and here online. In the coming weeks, I’ll be blogging on these and related subjects. Please chime in. And feel free to add your thoughts on issues raised in Ready as well, if you’re so moved.